Before the year comes to a close, I thought I’d post a list of my favorite Mac automation application updates of the year, as well as a few of my favorite applications I started using in 2015. 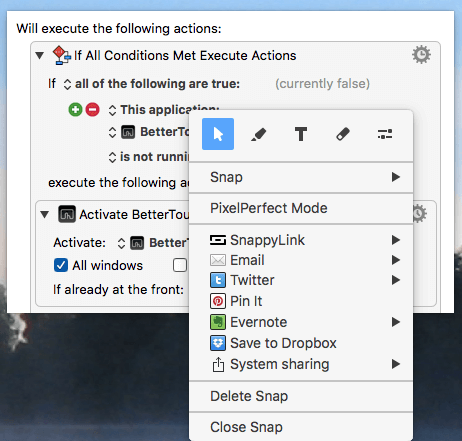 I plan to make this review an annual topic, because it’s important to highlight a few of the most useful updates for the Mac automation applications that I regularly write about for this blog. The list also includes a few features I recently discovered this year, but I’m not quite sure if they were added as updates during 2015. 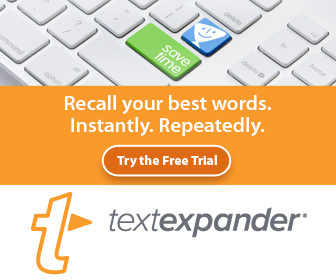 I’ve been a longtime user of TextExpander, and one of the most significant features I found useful in version 5.0 is the notification style reminder. I have hundreds of text expansions, and there are a few dozen abbreviations that I often forget while typing. So for example, if I type out the name, “TextExpander” instead of using the assigned abbreviation “txt”, TextExpander will briefly display a reminder of that abbreviation. At first I thought this feature would be an annoyance, but after enable and disabling it a few times, I realized that it is better to leave it on. So depending on what I’m doing, when I see the notification, I’ll actually delete the word I received the notification for, and then type the assigned abbreviation. By doing that, I’m more likely to remember the abbreviation next time. PopClip didn’t receive a significant update this year, but one of the PopClip extensions that I found very useful is one that sorts a list of text items alphabetically. There are dozens of other PopClip extensions that are just as useful. If you haven’t checked out the extension downloads (all free!) you’re probably missing out on a few time-saving utilities. I had serious problems with the 5.0 update of Dragon Dictate this year, and though most of the issues have been fixed in subsequent updates, I must admit that I sort of like the new Auto-Text category in the Commands Manager of Dragon Dictate. The Auto-Text category enables me to more easily locate the voice commands I set for text snippets. 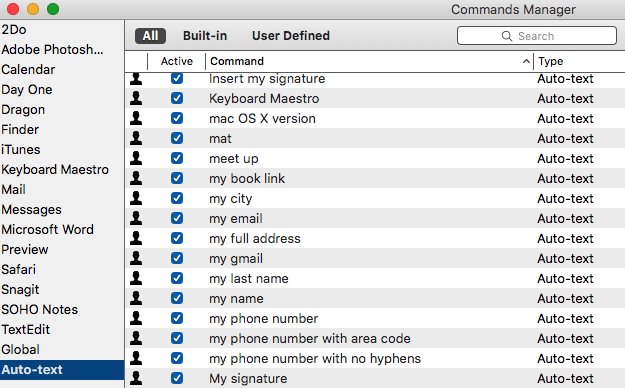 For example, I have voice commands for my address, phone number (e.g., “my phone number with area code”, “my phone number with no hyphens”, “my phone number” with hyphens), technical words, hashtags (e.g., #writers, #photographers), and mail signatures. 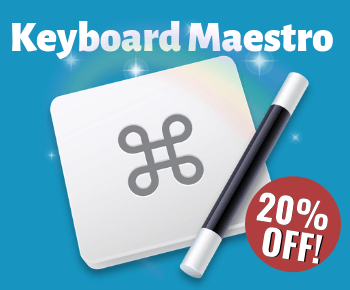 The 7.0 update of Keyboard Maestro includes dozens of new features and fixes, including new actions, triggers, group actions, and themed palette styles. But if I had to choose my favorite new feature, it would be the gear menu attached to every action. The gear menu includes controls for enabling and disabling actions, adding a note, assigning a color, and setting timeouts and notifications. These features are especially helpful when you’re creating a complex macro with several actions. 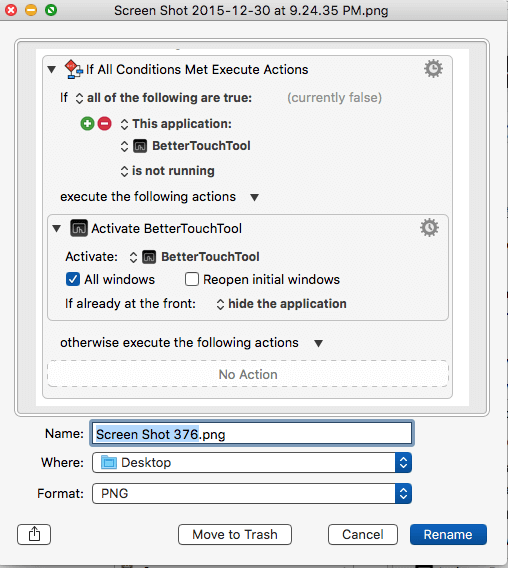 One of my favorite and most used Mac automation applications is BetterTouchTool. 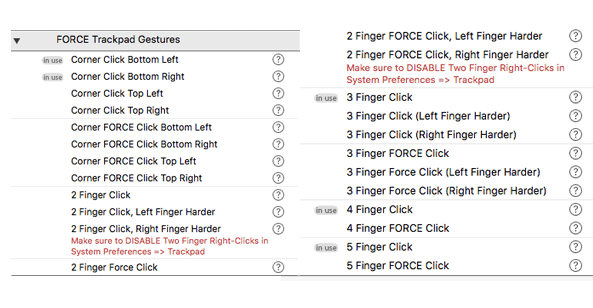 Its recent update includes force touch gestures that work with the new Apple trackpad and Magic Mouse. These additions simply mean that I have more finger gestures at my disposal, especially for universal actions. The 5.0 version of the desktop video application, ScreenFlow, also received a boatload of new updates. My favorites though include the new snapback and actions templates. If you’re not a user of ScreenFlow, it’s difficult to appreciate the power of these two features, but they essentially allow for faster editing of video clips, reducing what took numerous clicking and mouse movements in past versions. Though I downloaded several new applications this year, I only added a few to my daily workflow. Sharpshooter displays a screenshot right after it’s taken, which then allows for typing a name of image file, instead of having to click on the file when it shows up on the desktop in order to rename it. Because I use Dragon Dictate text dictation, I can typically voice dictate the name I want to use, and then issue the command, “Return” to save the renamed file. SnappyApp is another screenshot application that I use nearly everyday. You can take a screenshot and it instantly opens as if you’re viewing the file in quick view. The shot remains opens until you close or delete it. Shots can also be saved as a regular image files. I use this application especially for when I need to reference information as I type. It keeps me from having to click back and forth between applications or websites to view stuff. SnappyApp has several other cool features for sharing and annotating snapshots. It’s truly a great time saver, and the developers are only getting started. They’re working on a 2.0 version to come out next year. Well that’s it for my favorite updates and applications this year. 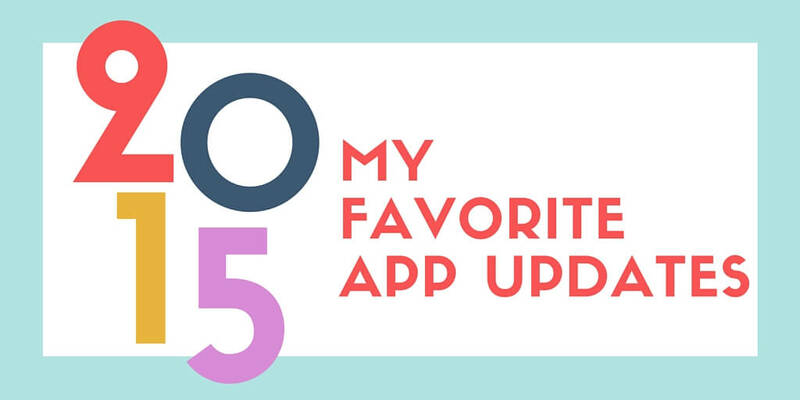 Feel free to share some of your favorite updates, features, and new applications. It’s always great to let developers know what features we find useful, especially for the all the hard they do.